The worst called strike of this season was thrown in the eighth inning of a game between the Astros and the Tigers on the second-to-last day of July. I measure these things by the distance between the location of the pitch and the nearest part of the rule-book strike zone, and, here, we have a called strike on a pitch that missed the zone by 9.8 inches. It’s not a pitch that’s out there on an island — there are always a bunch of called strikes on pitches that miss by six or seven or eight inches — but 9.8 inches is a hell of a distance. I’m holding up two fingers in front of me. Are they separated by 9.8 inches? I don’t know, but they’re separated by what my eyes estimate would be about 9.8 inches. Big miss, considering the umpire is *right there*. We’ve got the season’s worst called strike identified. And maybe the most amazing thing about it: no one cared. You couldn’t even bring yourself to care today. It’s impossible. You’ll see what I mean. But first, a brief statement. I hate SunTrust Park. I’ve never been there. It’s brand new. I’m sure a lot of thought went into its design, and I’m sure it has its perks. All the new ballparks have their perks. I don’t care about the SunTrust Park design or amenities. I care about the SunTrust Park technology. And the pitch-tracking data from SunTrust Park is garbage. It’s horribly calibrated, and it makes a project like this super annoying. I looked at dozens and dozens of potential worst called strikes. The bulk of the candidates were thrown in Atlanta, and all of them were off. By, like, several inches, in different directions. That’s been aggravating for me, today, but there are also some broader implications. Pitch locations feed into a lot of the data we like to use. And if you can’t trust the pitch locations, you can’t trust the data. Incorrect locations would affect, say, zone rates. They’d affect chase rates. They’d affect framing metrics. I hope that people smarter than me are aware of this. I hope they’re working to fix this, if they haven’t already. There’s no excuse. In its initial year of existence, SunTrust Park was messed up. Not in a way many people would ever notice, but *I* noticed, and right now I’m the one writing. Okay, now back to the worst called strike. We’re not going to Atlanta. We’re going to Detroit! Think about what you’re going to see. You’ve probably read posts like this before. You can already picture the season’s worst called strike, in the same way you can always picture the season’s worst called ball. The worst called ball will always be a ball on a pitch thrown somewhere over the middle. Can’t get worse than the absolute worst. And the worst called strike will pretty much always be a strike on a pitch outside. Won’t be a pitch inside — the batter would move out of the way, and the umpire would see that. Won’t be a pitch too low or too high — the umpire would see that. Umpires are better about the high ones and the low ones. Where umpires make the wackiest mistakes is with pitches away. And there’s no limit. There’s a limit with the worst called balls — it’s a pitch exactly middle-middle. Anything could technically be called a strike. It makes these calls, I think, a little less interesting, but I can’t very well write one post without the other. So let’s just get to it. Here’s the worst called strike of 2017. A full 9.8 inches outside. Not a single damn was given. That video is pulled from the Astros broadcast. It returned to game footage just in time. Here now is video from the Tigers broadcast. 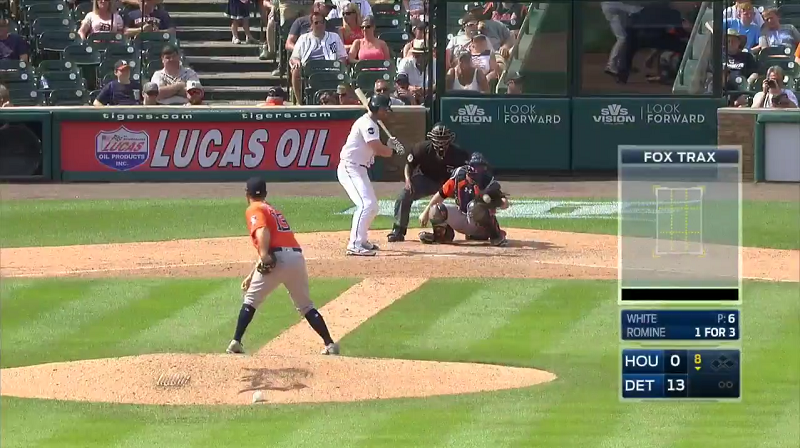 The worst called strike of the season, and fans in Detroit didn’t even see it. 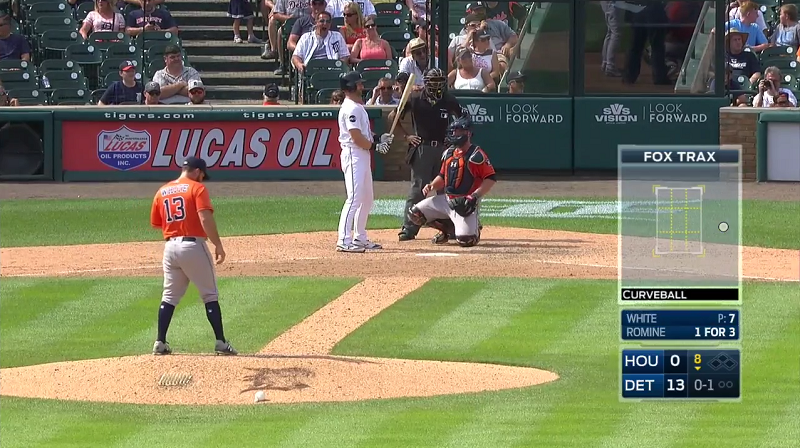 They saw an instant replay of a home run, and then, when that was over, the Astros’ catcher was throwing the ball back to the mound, after a first-pitch strike to Andrew Romine. Tigers fans were given only one single clue. The pitch itself was entirely missed. But there was a graphic on the screen. When the inning began, the Tigers were up 11-0. Alex Avila then hit a ball off the wall, and James McCann hit a ball beyond it. Two more runs, to add on to all the others. And although those were technically runs against the Astros’ pitching staff — the Astros’ eventual world-champion pitching staff! — they were also, more precisely, runs against first baseman Tyler White. White was a position player pitching. The Astros had long since given up. It used to be, even recently, that position-player pitching appearances were fun. They’re still more fun than any other pitching appearance toward the end of a blowout, but as these pitching appearances have grown more common, they’ve lost a lot of their novelty. One is less inclined to pay attention to every single pitch, and so few eyes would’ve been actually fixed on the screen when White’s first pitch to Romine was given the benefit of the doubt. It would’ve easily escaped notice. White was working quickly; the next pitch was on the way within the next 10 seconds. When position players come in, though, there’s still something of a breakdown of the rules. This is one area where the human element is most probably good for the sport. When someone like White is pitching, the game is over. It’s still being played, but, it’s over. And so while all the rules should still, in theory, apply, they no longer mean anything. Why be so strict about rule enforcement when the actual competition is finished? Umpires will still call guys safe if they’re safe, and they’ll still call guys out if they’re out. But the strike zone gets huge. Batters are pressured into swinging, because there’s no glory in taking pitches from a guy who doesn’t pitch. White has made three professional pitching appearances. He’s allowed eight runs in 2.1 innings. You don’t take pitches from Tyler White. Even if they’re balls. You swing, and you swing because it doesn’t matter. I think, in this case, the umpires have it right. The off-center camera angle is stupid, but here is the best screenshot I could manage. To try to be of some help, here is the same screenshot, but this time with a red line I drew in MS Paint. You can see home plate, just barely, and so you can see where it ends. This pitch was nowhere close to where it ends, and that’s just plainly true, even if no one involved batted an eye. White just wanted to pitch until he could stop pitching. Romine was thrust into a no-win situation. Hitters will tell you these are always no-win situations. No one actually ever wants to have to hit against a position player. What was Romine to do? Even after the strike call, what’s he going to do, turn around and protest? Slump his shoulders and sigh? Even if Romine was bothered, he couldn’t have a tell. And I don’t think he was particularly bothered. Strike one. Fine. It’s not like he was going to see a strike three. If there’s a hero to be found anywhere, I’d say it was Brent Strom. 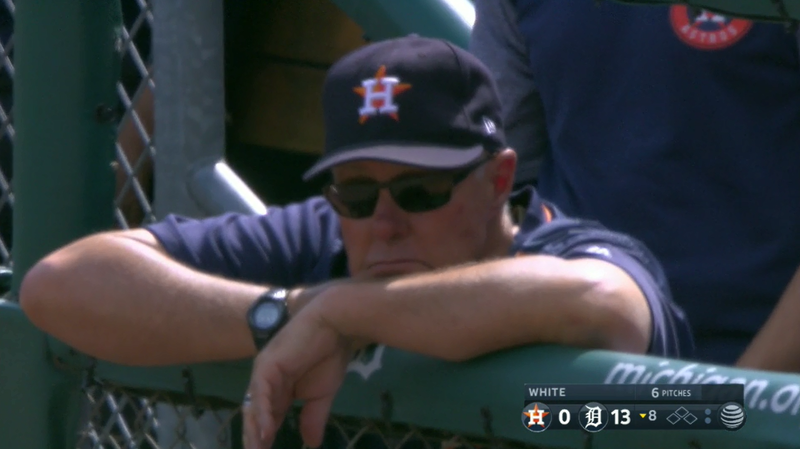 The Astros’ pitching coach couldn’t help but follow along. Now, when you’re in uniform in the dugout, you kind of have to be there. You might as well keep watching the game, because, what else is there to do? But if you’re a pitching coach, it’s not often you get a break from having to watch every pitcher closely. Strom was given such a break, but he just couldn’t avert his eyes. My actual current favorite thing about position-player pitching appearances might be the havoc they wreak with the automated services. 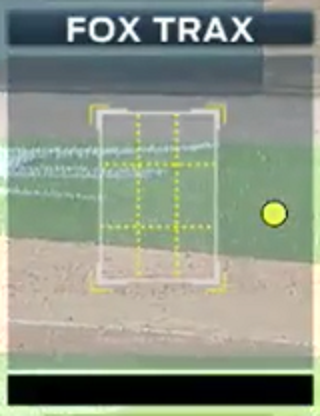 According to the TV broadcast, the pitch that White threw to Romine was a curveball. According to Gameday, it was a slider. According to Texas Leaguers, it was a knuckleball. And according to Baseball Info Solutions, it was a changeup. And yet, according to Tyler White, it was actually a nothing. There was no true pitching mix from White, though Statcast™ tried to credit him with an array of knuckleballs, changeups and the occasional cutter. He simply threw the ball over the plate, until the results from the first two hitters made him reassess how hard to throw. White’s first six pitches of the inning all ranged between 76 to 84 miles per hour. The first pitch to Romine clocked in at 66. It wasn’t a fastball, because White was throwing well below his maximum fastball speed. But it also wasn’t technically a changeup, because White didn’t use any kind of changeup grip. He just…threw slower. The pitch was a nothing. Strike one. He should throw that pitch more. The Tigers’ TV broadcast had checked out. Who could blame them? Here’s the call of the pitch. Mario Impemba: There’s a strike called on the outside corner. Credit, at least, for acknowledging that a pitch had been thrown in the first place, but, outside corner? Impemba gave the umpire the benefit of the doubt. Compare that call to the Tigers’ radio broadcast. The radio broadcast was on it. Dan Dickerson: Now a knuckleball strike to Andrew Romine. That was four balls’ width off the plate away. Four! Strike one. Swing and a foul past the screen…I mean, I know it’s a position player, and maybe you feel bad for him, and I know it’s 13-0, but that pitch was a foot off the plate. Words don’t do a great job of conveying the tone. Dickerson wasn’t outright complaining that the Tigers got jobbed, or anything. He was just telling the truth, as he saw it, and as it was. He was kind of chuckling along the way, in amazement. I don’t know if he had any idea he’d just seen the worst called strike of the season. Perhaps he had exactly that idea. Minutes later, the Tigers wrapped it up, and the Astros licked their wounds. They were in the earlier bit of a stretch that would see them lose 12 out of 16 games. The Astros’ first-place standing was never threatened, but there was a mounting uncertainty. A mounting concern that, maybe, actually, the team wasn’t good enough. That same team won the World Series last week. Granted, that same team also traded for Justin Verlander. So I don’t know which lesson you could learn is the right one. We hoped you liked reading The Worst Called Strike of the Season by Jeff Sullivan! Do this for game 6 of the ALCS and you might not make it out alive. I have about 30 screenshots from Statcast of that game, and it was a messterpiece. Once the ump establishes the zone, even if it’s horrible, it’s on the players to conform. They can’t stop mid-game and ask for his zone to be corrected. Yankees blew that game by constantly taking pitches called a strike 5-10 times. You should look at the Statcast zone for the Astros: 3 players walked 3 times on 12 strikes. The data is still available, and, like I said, I have about 30 screenshots. If you don’t believe me, CJ Nitkowski was live-tweeting bad calls, so you can verify this against his stream. I wouldn’t really trust ESPN data. I have been watching game and their information has been way off on what is happening in the game. What’s the best resource? Brooks doesn’t appear to be normalized, and fangraphs always has very good zone analyses. Do you know what they use? A lot of articles here use either Brooks’ zone or the zone from Baseball Savant, which is generated from StatCast data. Here’s the bottom of the fifth inning from ALCS game six. Kelly Richards was a stay at home mom who resigned from her job? Did she abandon the kids? Forget about her $6000-$8000 a month, will somebody think of the children?! I can absolutely believe that resigning from “Stay at home mom” will earn you $6000-8000 a month!